If you are looking for a compact, full-featured stroller then this might just be the stroller for you. The Quad is a brand new addition to the Valco line up. Unlike the other Valco singles it offers a four wheeled configuration along with all of those wonderful Valco features, including the option of a toddler seat. Four-wheeled stability for urban and rural terrain plus an optional second seat in a very portable size, what more could you want? As a long time Valco fan, I was very excited to see it in person and test it out first hand. The Quad comes in a very small box and surprisingly still has minimal assembly required. All you need to do is pop on the wheels and the canopy. It could not be simpler and is done in a few minutes. Valco wheels are very easy to take on and off, so breaking down this stroller and putting it back together is effortless. I was really surprised at how compact and light it is. 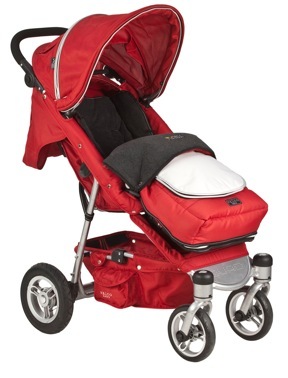 It weighs just 23 lbs, more than an umbrella stroller, but not very much for a stroller with so many great features. The Quad features 4 wheels, hence the name, but it still offers the same three wheel settings as the Tri Mode- fixed, for light jogging, 45 degree mobility for use with the toddler seat and full swivel for normal use. The full swivel wheels do make it very agile and it easily maneuvers through any space. The rear wheels are 10 inch pneumatic tires which, coupled with Valco’s great suspension, offer a very smooth ride. You get the all-terrain agility with four wheels that make it easy to pop over a curb or glide through a store. Included with the stroller are a comfy removable seat pad, an infant head hugger, rain cover, tire pump and a pivoting adjustable handle. The canopy has two peekaboo mesh inserts and is very generous. It can even be unzipped for a fuller extension all the way down to the seat. Instead of three or five recline settings, the One Touch recline system allows for an easily adjusted recline with any position between fully upright and fully reclined possible. Other great features are the adjustable footrest, reflective accents, sturdy aluminum frame, plenty of storage and the very easy to use rear brake. The harness is a five point harness with a puzzle lock, so it’s easy for you to undo, but not for your child. Available optional accessories include the full bassinet, the new “Husssh” bassinet insert, a ride on board, drink holders, car seat adapter(compatible with Maxi Cosi, Chicco and Peg Perego infant seats),, travel bag, footmuff, zip -in sunshade, snack tray and my favorite option, the toddler seat. 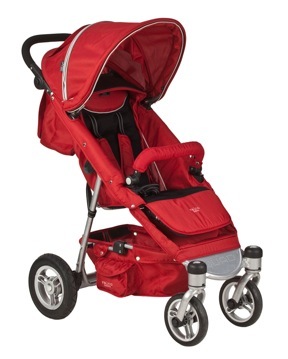 One of the greatest things about Valco strollers is that they allow you to add a seat to several models. I have had the Twin Trimode with a toddler seat for several years and love that I can use it for two or three of my children. I also love that the Quad can be used as a single or has the option of an extra seat for an extra rider. >First of all this is a really nice stroller. 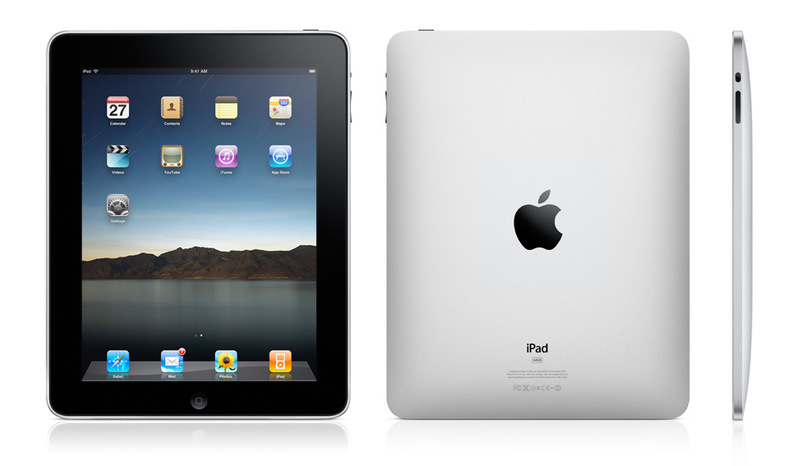 It offers a comfortable seat, amazing recline and canopy options and is very easy to fold and carry. 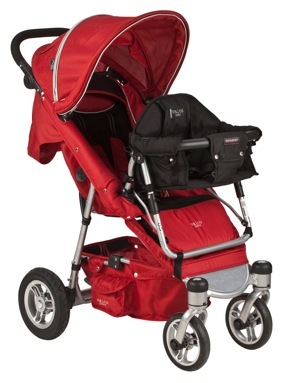 The Quad is a great in and out of the car stroller and unlike many smaller strollers, it can really handle any terrain well. 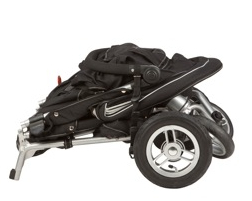 I would feel comfortable taking it over anything or leaving it in the car for an errand stroller. We can even fit it in the back of our minivan with a double stroller because it takes up so little space. 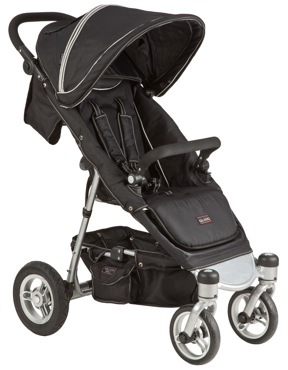 It’s a very functional all around stroller that is still very comfortable. I also love that it comes with everything you need straight out of the box, such as the rain cover and tire pump, which are often extra with many strollers. I tried the seat out with three of my children- ranging from six months to three years in age and all three fit well in the seat. The straps easily adjust for all three and they have plenty of room in the seat, as well as headroom under the canopy. There are side zippers on the back of the seat that make it really easy to access the straps to move them from one position to another. The mesh inserts in the canopy offer ventilation and let you watch your baby. Because there are two, it’s possible to roll up either flap and still have the opening no matter what position you have the canopy in. The storage basket is great and can hold plenty, plus it has two side pockets for small items. During our test, we tried out the Quad with the additional toddler seat and it was still super easy to push even with my 22 pound 21 month old in the front and my six month old daughter in the main seat. It didn’t feel tippy or sluggish and was just as easy to push as it was with the seat off. There is a new version of the toddler seat coming out this summer that will offer a higher seat back and more leg room for the rider in the main seat and will still have the option of a canopy. Both updates are welcome changes and should make this an even better option. none, maybe more color options would be nice.